Aussie rock legend Angry Anderson would love to see Axl and Slash get back together. Byron Cooke for Triple M's Radar Radio asked Slash how he felt about that. "He's got a valid point," admitted Slash. "But we just haven't talked, Axl and I, and no efforts have been made on either side to get that together. I figure, if something's supposed to happen it will and if it's not, it won't." 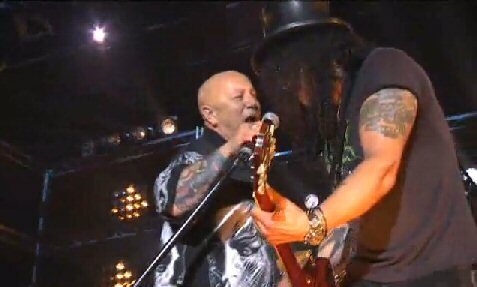 The Rose Tattoo legend is actually a good mate of both Slash and Axl (how many people can say that!) and he remains hopeful the pair will see the wisdom in reigniting the passion they had for one another. The former Guns N' Roses guitarist did appreciate Angry's words of wisdom. "I appreciate Angry's take on it because he's a sensible guy. From his perspective getting back together seems reasonable. And he is friends with both of us." However, Slash really saw only one way it would ever happen. "What it really needs is a lot of expensive therapy," he laughed. Slash, who left GN'R in 1996, tells Billboard.com, "if Guns had stayed together it would have gone through some musical changes. Axl has his thing and I was sticking to whatever it is I do. But it would have stayed as big and relevant as it was when I first started." Unsurprisingly Slash lists the band's classics as amongst his top tracks from their catalog - "Sweet Child O'Mine," "Paradise City," "My Michelle" and so on. But he says he's "fond" of "Coma" and "Locomotive" from Use Your Illusion I and II respectively, and says the video for "Paradise City" is the only one he likes because it was live. The band becomes eligible for Hall of Fame induction in 2013 and it's almost unthinkable they won't be voted in first time round. Whatever happens, Slash is planning to attend. But he says, "I have no idea how that's supposed to go. If Axl, Duff, Izzy and myself start communicating, it could go one way. If we don't, God knows." Mick Wall: "Axl is Rock's Michael Jackson"